The Kilpilahti combined heat and power (CHP) project is located in the Kilpilahti industrial area in Porvoo, Finland. Image: courtesy of Borealis. Thermal heat generated from the project will be supplied to Neste Oil’s refinery and the petrochemical plant of Borealis. Image: courtesy of Borealis. 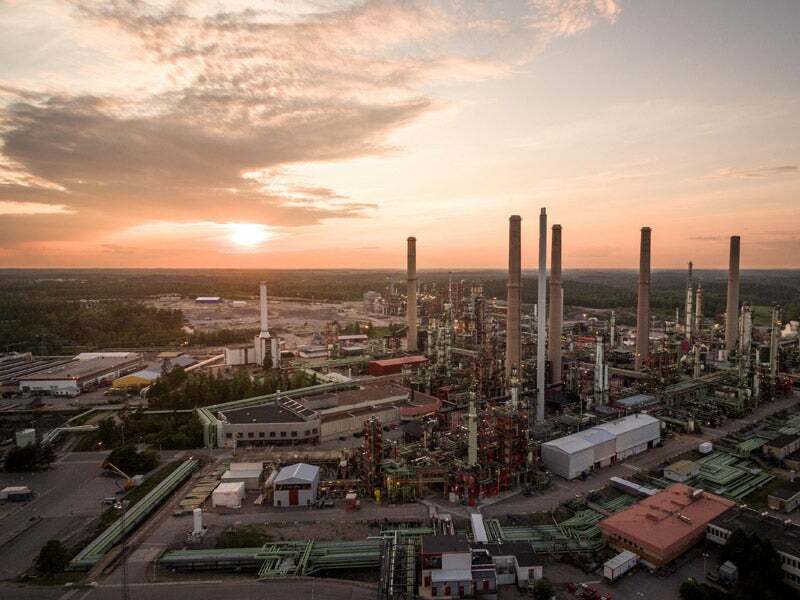 Asphaltene and other different gaseous and liquid fuels produced as byproducts from the adjacent facilities of Neste Oil and Borealis will be used as fuel by the CHP plant. Image: courtesy of Neste. The Kilpilahti combined heat and power (CHP) project is a modernisation project that aims to replace two old boilers and two steam turbines from the existing power plant in the Kilpilahti industrial area in Porvoo, approximately 40km east of Helsinki, Finland. Proposed installed capacities for the project are 450MW of thermal heat and approximately 30MW of electricity. Thermal heat will be supplied to Neste Oil’s refinery and the petrochemical plant of Borealis within the same site, while electricity will be supplied to the grid. The project will also produce demineralised water. The project achieved financial closure in March 2015, while commissioning is scheduled for mid-2018. It is expected to generate up to 700 jobs during the construction phase and up to 40 jobs during the operations phase. The project is being developed by Kilpilahti Power Plant, a joint venture (JV) of Neste Oil Corporation (40%), Veolia Group (40%) and Borealis (20%). It will be operated and maintained by Veolia Services Suomi Oy, a subsidiary of Veolia, under a 20-year agreement. Neste Oil transferred the ownership of the power plant to the JV in March 2015. The existing power plant is equipped with two gas and oil boilers, and two steam turbines that were commissioned in 1971, a gas boiler commissioned in 1989, and two gas turbines commissioned in 1989 and 1997 respectively. The project involves the replacement of the facilities commissioned in 1971 by installing a main circulating fluidised bed (CFB) boiler using asphaltene as its main fuel, two oil and gas steam boilers using different gaseous and liquid fuels produced as byproducts from the adjacent facilities of Neste Oil and Borealis, and a new steam turbine. New units of the multi-fuel CHP plant will be constructed adjacent to the existing power plant and share existing fuel supply pipelines, cooling water systems, drainage facilities, the 110kV grid connection network and ancillary facilities. The project will further involve the construction and installation of a new demineralised water plant and its ancillary automation systems, a new electrical room, a control room, and an office building. Compared to existing facilities, the project is expected to reduce carbon dioxide emissions by approximately 20%. It will be constructed to comply with the latest environmental regulations, including the European Commission’s Industrial Emissions Directive (IED). Gaseous emissions will be reduced from the main boiler by deploying enhanced combustion technology. A particle filtration system will be installed to reduce dust emissions, a flue gas scrubber will remove sulphur dioxide, and a selective catalytic reduction (SCR) system will reduce nitrogen oxide emissions. In addition, adequate walls and devices will be placed to mitigate noise. The engineering, procurement, construction and commissioning (EPCC) contractor for the project is Técnicas Reunidas (TR). Neste Jacobs has been contracted to integrate project facilities with the existing facilities. The environmental impact assessment (EIA) study for the project was performed by Pöyry Finland Oy. The total investment in the project is estimated at €400m ($447m approximately). The European Investment Bank (EIB) is providing a €175m ($195m) long-term loan, while the Nordic Investment Bank is providing a €80m ($89m) loan. Other commercial banks funding the project include the Bank of Tokyo-Mitsubishi UFJ (BTMU), ING, Nordea, Skandinaviska Enskilda Banken (SEB), and Unicredit. Sirius Engineers Ltd is a Finnish engineering company providing power plant flue gas cleaning and engineering, procurement, and construction management (EPCM) services. Valmet is a global developer and supplier of energy production and monitoring, and fuel utilisation solutions for the power industry. The CEMS II e is a multicomponent continuous emissions monitoring system, which has successfully completed EN 15267-3 testing for the analysis of low range HF, low range NO, CH4 and Formaldehyde. The Gasmet™ In-Situ analyser offers a cost-effective alternative for extractive systems in continuous emissions monitoring and process monitoring, providing simultaneous data for multiple compounds. Borealis is a leading provider of chemical and innovative plastics solutions. With sales of €7.1bn in 2011, customers in more than 120 countries, and around 5,300 employees worldwide, Borealis is owned 64% by the International Petroleum Investment Company (IPIC) of Abu Dhabi and 36% by OMV, the leading energy group in the European growth belt.